Dr. Mahathir with top Pakatan Harapan leaders, Bersatu president Muhyiddin Yassin, PKR president Dr Wan Azizah Wan Ismail, Amanah president Mohamad Sabu and DAP secretary-general Lim Guan Eng at a press conference in Sheraton hotel tonight. PETALING JAYA: Pakatan Harapan (PH) government will give priority to the economic management and business finances aspects, Tun Dr. Mahathir Mohamad today said in a press conference after being sworn in as the 7th Prime Minister of Malaysia before His Majesty Yang di-Pertuan Agong, Sultan Muhammad V at the Istana Negara. Mahathir said the emphasis on economic and business aspects is very important as this will help push the prices in the stock market. “There is no cause for the devaluation of Ringgit Malaysia (RM) as we want to keep it as steady as possible and compete in the open market,” Mahathir said in a special speech after he became the Prime Minister of Malaysia for the second time following PH landslide victory in the 14th General Election on 9th May. 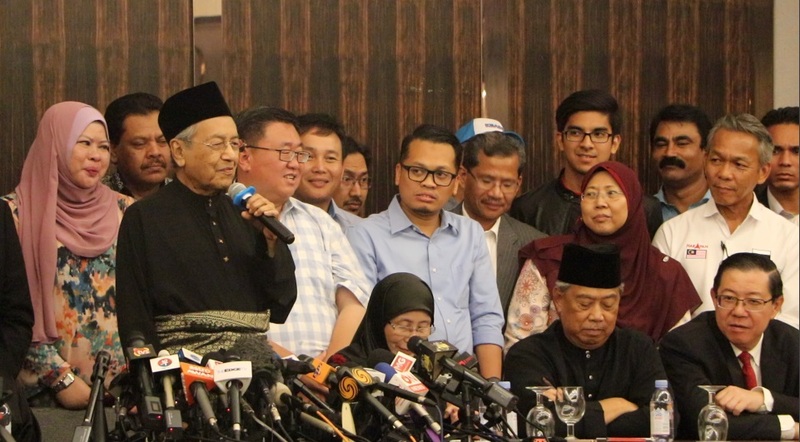 On the GE result, Mahathir said, PH managed to form the government after achieving a simple majority of 120 seats out of 222 Parliamentary seats. He was sworn in as the Prime Minister at 9.30pm this evening after the Election Commission (EC) finalised the election results at 3 p.m.
Mahathir also expressed his gratitude for the overwhelming support from members of the public starting from the general election until his appointment as PM. He regarded the two events as the most historical political event in Malaysia. The Prime Minister also said, according to Bank Negara Malaysia (BNM) report, Malaysia’s debts have reached RM800 billion. “In the business world, the government of Malaysia has been following the concept of “Malaysian incorporated” that is the private sector cooperating with the government. This concept will help entrepreneurs invest outside the country,” he said. Mahathir added, the government will also try to get back 1MDB money that is kept in the United States of America (USA) Switzerland, Singapore and also from Jho Low to pay the heavy national debts. Meanwhile, Mahathir said PH government that starts its function on Friday will be based on the Federal Constitution and at the same time uphold the laws of the country. As promised in the PH Election Manifesto, Mahathir said, the government will waive oppressive laws like Anti Fake News Act 2018 and the National Security Council Act 2016 that was designed to frighten people. “We will not adjust the petrol prices every second and we will abolish the term “cash is the king.” Please remember that I was a dictator,” he said and was applauded by PH supporters and media practitioners from all over the world. Regarding PKR leader Anwar Ibrahim’s case, Mahathir said the PH government will try to get a full pardon from the King so that he is free to indulge his political commitments. To a question on the former Pandan MP, Rafizi Raml who was sentenced 30 months imprisonment for exposing confidential banking details relating to the National Fedlot Cororation (NFC) scandal, the PM said, PH will look into the charges whether it is politically motivated. If some element of unfairness is found then they will see how best such case could be treated.